Despite other things going on this month (the garden, a holiday, grandkids) I also managed to read 7 books so that's not at all bad really. Of course that's helped by the current heatwave. I hate being outside when it's hot so at the moment I'm to be found indoors in the afternoons, windows and doors open, reading. 32. 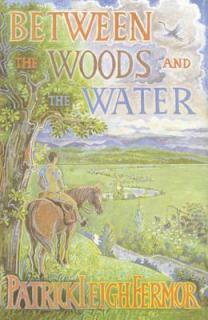 Between the Woods and the Water - Patrick Leigh Fermor. This is second part of the trilogy which charts the author's walk from England to what was then Constaninople and is now Istanbul. In this part he walks through Hungary and Transyvania stopping off at intervals to stay with various contacts or friends of friends. It sounded idyllic but always you're aware that this is the mid-1930s and within a few years the whole region will be changed beyond recognition by the war. There're beautiful descriptions of the mountains, the old towns, and a wonderful carefree atmosphere pervades the whole book. The people are friendly and thrilled to have an Englishman staying with them. A beautiful book but I found it impossible to shake the sense of impending doom. 34. 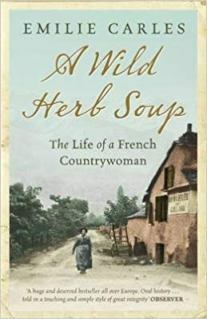 A Wild Herb Soup - Emilie Carles. Emilie Carles was born Emilie Allais in the year 1900 in the village of Val-des-Prés, in the Haute Alpes region of France. It was very remote and isolated and the Italian border was just a few miles away over the mountains. The family were of peasant stock and proud of it but life was hard, hard, hard. Emilie lost her mother when she was six, she was gathering in crops when she was struck by lightning and killed instantly. Her father, Joseph, then had six children to bring up on his own so all the children had to pull their weight. Work was a way of life because if you didn't work, you didn't eat. Simple as that. But somehow through all this Emilie managed to get herself an education and become a teacher. It's an incredibly inspiring story, heartbreaking in places - a sister died in childbirth because she didn't know what was happening and wouldn't let anyone near her, her husband being away fighting in WW1 - but through it all Emilie's spirit shines. What an amazing person she must have been... a thinker, a reader, a campaigner, a teacher in the best sense of the word. When I read about the hard lives of women like this I realise that these days we hardly know we're born. It's so nice to have a reading month like this. Lots of really good books with different settings which have taken me all over Europe... Italy, France, Germany, Hungary and Romania, that's not bad! 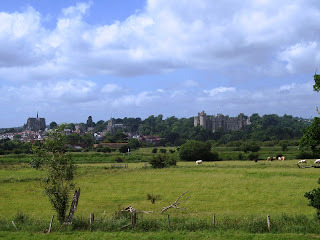 And this is where I spent a few days earlier in the month: Arundel in West Sussex. One of the prettiest counties I've been in... rolling hills and pretty villages galore. We had a super time. I seem to be in a French crime book mood at the moment... not that unusual for me I suppose. LOL! 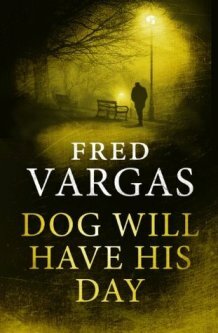 First up, Dog Will Have His Day by Fred Vargas. This is book 2 of her 'Three Evangelists' series, set in Paris. Louis Kehlweiler is one those people who watch and keep tabs on things. He has a network of people who also watch and tell him what's going on around France. In this manner he solves occasional crimes. Out watching a politician's house one night he spots something, a tiny piece of bone embedded in some dog excrement. He recognises it as human bone and wants to know how this could happen. Investigations lead Louis and his pet toad, Bufo, to a small fishing village in Finistére in the extreme west of Brittany, where a man with a dog travels to Paris every week. Why? He finds he needs help and calls in two of the Three Evangelists, Marc and Mathias, both bring things to an investigation that he doesn't have, which is just as well as an ex-girlfriend living in the village could be clouding his judgement. This is more of a 'Two' Evangelists book than 'Three' but that's ok, the book doesn't suffer at all. Louis is a fascinating character, the product of a liason between a German soldier and French woman during WW2, so his life has never been easy. His habit of watching and keeping files and newspaper cuttings on people is intriguing and made me wonder if there are people doing this kind of thing. Excellent sense of place in this story, I've been to Finistére and it really is as wild and woolly as it's portrayed in the book. Really enjoyed this one and hope to see more of Louis in future books in this series. Although as there are only three and all were written in the late 1990s it does look like there might not be any more, especially as Fred Vargas seems to be concentrating on her Adamsberg series now. Ah, well. 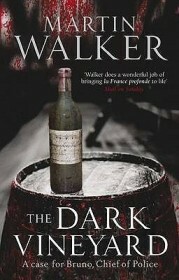 Next, The Dark Vineyard by Martin Walker. This is book 2 of his 'Bruno, Chief of Police' series. Bruno Courréges is pulled from his bed early one morning via a call telling him a field and barn are on fire. Fearing the blaze will spread in this very dry summer the fire brigade are already there fighting the fire. It turns out that the crop that's been set alight is a GM crop that hardly anyone knew was there. Is the the work of 'ecolos' who live in the area, possibly a members of a local commune? It also emerges that an American wine corporation is interested in developing the wine growing capacity of the region and the owner is already there in St. Denis making contacts and putting out feelers. One old man, his home, and farm are standing in the way of these plans. This is a can of worms and Bruno needs to handle this with kid gloves if he's to succeed in his quest to find the arsonist. One thing he doesn't need is a dead body to add to his woes... After I'd read the first book in this series I was undecided about carrying on. I liked it well enough but wasn't mad about it in all honesty. Regardless, I did decide to reserve this second book from the library and am pleased I did as I actually enjoyed it more than I thought I would. I liked its quirky set of characters, the details of Bruno's life (which I think I found a bit irritating last time) and the very strong sense of place in the Perigord region of France. I enjoyed all the foodie details too, even if one or two made me think, 'Hmmm, not sure about that...' A good instalment and I shall certainly read on now. Lastly, The Flemish Shop by Georges Simenon. 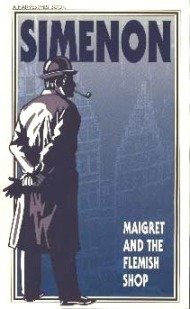 A Flemish woman named Anna Peeters, living with her family just over the Belgian border in France, comes to see Maigret. She wants him to come to her coastal town to prove that her brother, Joseph, is not responsible for the disappearance of Germaine Piedboef. This young woman has had his child, out of wedlock, but Joseph is engaged to someone else that the family want him to marry. The whole village thinks this Belgian family have murdered Germaine but Maigret is unconvinced. Another wild coastal Maigret story, these are always quite good as Georges Simenon was excellent at conjuring up the isolation and insular nature of life in these regions. This is a fascinating 'family' based story which explores the sometimes claustrophic atmosphere that exists around some homes. Human nature at its most obessive and stifling and also 'inexplicable'. I do hope ITV will dramatise a few of these 'away from Paris' Maigret books. I've been indulging in one of my favourite reading pastimes this last week - armchair travelling. First I went to Italy in the early 1920s and then on to the post-war Germany of the 1930s, so not just armchair travelling, 'time' travelling too. First up, The Enchanted April by Elizabeth Von Arnim. Lotty Wilkins, married to an austere, penny-pinching banker, sees a notice in The Times for an Italian castle available to let for a month. She'd love to go but can't see how it would be possible. She sees another member of her ladies' club, Rose Arbuthnot, reading the advert. Rose is married to an author of historical books, the salacious subjects of which Rose does not approve as she is rather religious. Lotty seizes her chance and persuades Rose that they should club together and hire the small Italian castle. After much persuasion Rose agrees and the two of them decide to find two more women to share the cost. Neither of them has any interest in asking their husbands to go. The two women they choose to share the castle with them are Lady Caroline Dester, a beautiful young woman who wants a month away from too many admiring men and a Mrs. Fisher an older woman, very set in her ways and used to giving orders. On arrival Lotty and Rose find the castle to be isolated and utterly magical, situated as it is on the coast amongst fabulous gardens. They are, however, shocked to find that Mrs. Fisher and Lady Caroline have arrived ahead of them and taken the best rooms and decided that bits of the garden and castle should be for their sole use. Is this a foretaste of things to come or will the castle weave its magic spell on four women searching for answers. What a delight this book was. I loved Lotty and Rose and their daring spirits. Both were quite alarmed at what they'd done in leaving their husbands behind to go on this jaunt. From my 21st. century perspective this seemed acceptable but back in the 1920s it would be have been questionable to say the least. In Lotty's case I actually thought it served her husband right and loved how she blossomed in Italy. Very interesting hearing about life from Lady Caroline's point of view... how tedious things can be when you're very beautiful... she talks of people 'grabbing' her as though they own her, men never leaving her alone for two minutes, the envy of other women who assume she's after their husbands when she's not... quite the reverse in fact. On the surface this is a charming book about holidaying in Italy, but in reality it's much deeper than that. It's about different kinds of marriages and how women learn to cope and compromise and often rise above intense difficulties. And it's also about the magic of place and how that can have a huge impact on lives and events. Loved it. I've read Elizabeth Von Arnim's German Garden book but she's written a lot more and I'll be on the lookout for them now. 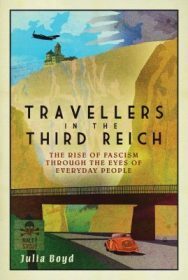 Next, Travellers in the Third Reich: The Rise of Fascism Through the Eyes of Everyday People by Julia Boyd. This is my fifth book for the 2018 European Reading Challenge covering the country of Germany. "Foreign visitors who concerned themselves with the plight of the Jews – and the majority did not – had to deal with an unanswerable question. How was it possible for these warm-hearted, genial people, noted for their work ethic and devotion to family values, to treat so many of their fellow Germans with such contempt and cruelty?" What came over was how desperate ordinary Germans were for the British to approve of what was happening in Germany. The new government wanted a formal alliance but of course that didn't happen. What did happen was that right up the moment war broke out British parents were still sending their teenage children to Germany to take in the culture and learn the language. Author, Julia Boyd, is dumbfounded by this and I must admit I was surprised too. There's a lot to take in in this book but it's very readable indeed and I zoomed through it in a few days. For anyone thinking of trying to learn a bit more about WW2 this would be an excellent place to start as it explains a lot, puts various events into context and from it you can understand how war was inevitable. An excellent read and a keeper. I gave both of these books a five star rating on Goodreads, not because they were perfect - they weren't - but because I couldn't stop reading either of them and was always keen to pick them up and read on. That says a lot because it's not always the case by any means. The garden's grabbing a lot of my attention at the moment and last week was half-term so fun with the grandchildren was had. All nice but it means I'm behind with book posts and likely to remain so possibly until Sept. Answer: don't do long reviews of everything I read which is what will happen with May books. So, books read in May... seven in all, not bad for me. 21. The Essex Serpent - Sarah Perry. 24. 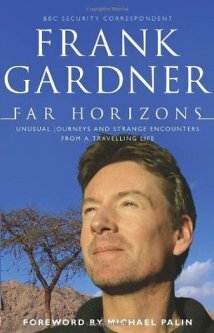 Far Horizons - Frank Gardner. Frank Gardner is the BBC's Security Correspondent, very familiar to most people who ever watch the BBC News. In 2004 he was shot and left for dead by a terrorist gang in Riyadh in Saudi Arabia, he didn't die but his cameraman sadly did. Before that Frank was a person who sought excitement via extensive travel around the world. This book charts many of his trips but Gardner always had a special love for the Middle East and it comes over very strongly in this book. After he was shot he put his life together again and continued travelling but of course he focusses on many of the challenges which come as a result of travel with a wheelchair. This is an excellent book by an incredibly brave man, interesting and rewarding to read. There's a good interview with him here by the Daily Telegraph newspaper. 25. Seven Dead - J. Jefferson Farjeon. 26. A Walk Across France - Miles Morland. 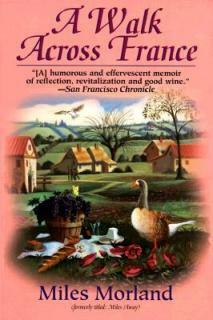 In his mid-forties Miles Morland, a banker at the London Office of a Wallstreet firm, decides to give up his job to walk across France with his wife, Guislaine, who is herself French. People think he's mad, of course. They choose the route at the bottom of the country, shadowing the Pyrenees but not walking in the mountains, from Gruissan-Plage on The Med. to Capbreton on the Atlantic coast. As French travel books go, I found this kind of middling. The walking, the descriptions of the countryside, towns and people, that was all fine, enjoyable, interesting. But for me there was a bit too much about his previous life as a banker and this I did not find at all interesting. So there you are... swings and roundabouts. Some books are just like that. 27. 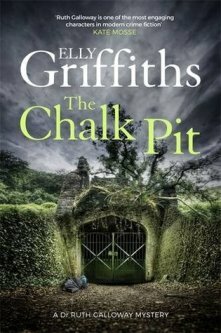 The Chalk Pit - Elly Griffiths, book 9 of the Ruth Galloway series. Ruth is called in to examine some bones found in the abandoned chalk mine tunnels that run under Norwich. She thinks they're very old so no need to call in the police. A homeless woman goes missing but no one seems to be much concerned until a friend says that she's 'Gone underground'. A figure of speech or something more sinister? Then a local woman goes missing, a mother of three children with no reason to just walk off. Is there a connection between all of these occurences? Well of course there is, LOL! Yet another excellent installment of Ruth's complicated life with her daughter and policeman, Harry Nelson. I'm trying to get used to the twists at the end but they nearly always catch me by surprise. One of my favourite modern crime series of the moment. So, a good reading month for me... not by quantity but quality. Every single book was good to excellent and I really can't choose a favourite so I'm not going to. I'm just going to feel grateful for good books when there's nowt on the telly... and with the World Cup fast approaching I fear there will be even more 'nowt on the telly'! 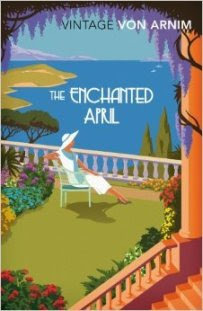 My first book of June has been read and finished and was The Enchanted April by Elizabeth vo Arnim. Delightful. Will try to find a moment to write a few words about it soon.